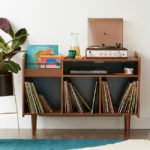 Stylish modern-day retro from John Lewis, with its Mira furniture range. 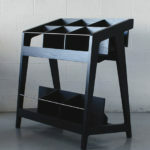 The range is described as 'midcentury Scandi-style furniture', with angled legs, subtle curves and above all, simplicity. All the items in the range are made of lacquered light oak wood, with some pieces coming with white ply covers. 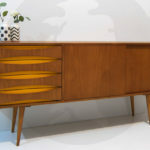 See the site for the full range, which includes a coffee table, lamp table, console table, TV stand and bookcase, to name just some of the items. Prices start at £199 for the lamp table.